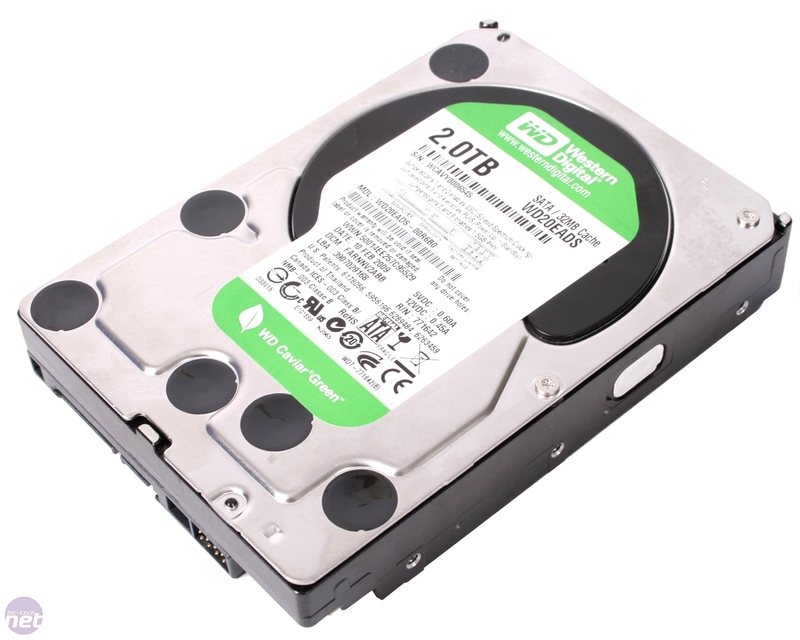 As fast as the latest batch of SSDs has proven to be, for maximum storage you still can’t beat the trusty mechanical hard disk drive, reinvigorated in the last two years with the development of perpendicular recording and the release of truly massive hard disks which have managed to deliver surprisingly speedy performance. 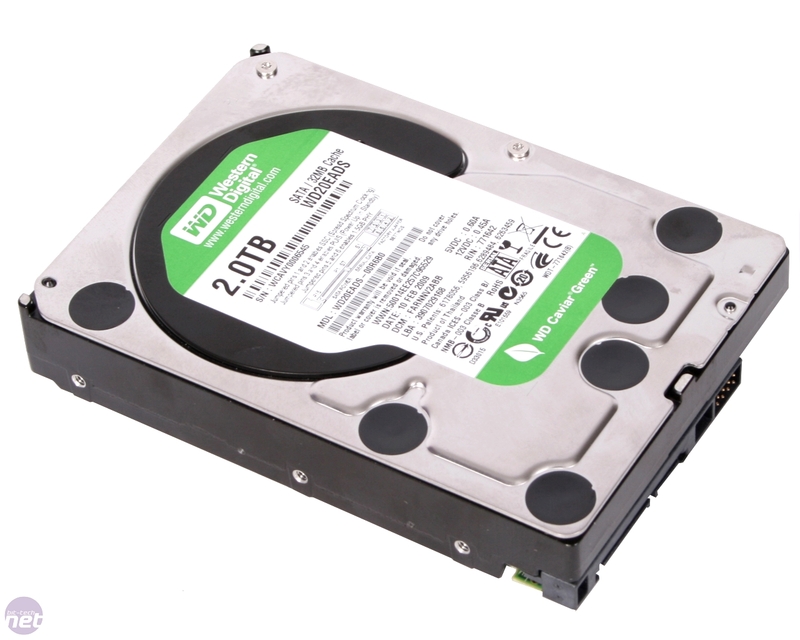 This trend of ever larger hard disk drives shows no signs of stopping either, with Western Digital the first manufacturer to reach the coveted two terabyte capacity with its Caviar Green line of hard disks. While we might throw that 2TB figure around fairly casually though, it is an almost ludicrous amount of storage. In terms of high quality MP3 it represents 1.7 years of continuous playback, in DVDs it’s 443 full image rips – it’s almost a frightening amount of storage to fit into an unassuming 3.5” hard disk, especially when you consider the ramifications of drive failure. However, the accomplishment is still impressive with Western Digital using four whopping 500GB drive platters with eight separate drive heads to accomplish the feat. 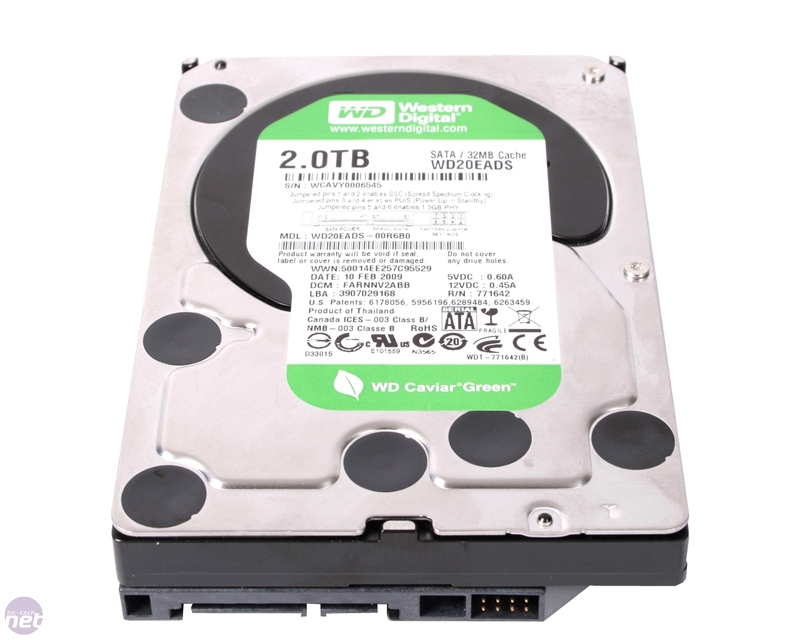 This means that the 2TB Caviar green packs one of the largest platter densities on the market, usually a strong indicator of impressive hard drive performance. There have been some sacrifices, though. Western Digital doesn’t list a set spindle speed for the drive because, as with all Western Digital Green hard disks, each drive is tuned to use a platter speed of anywhere between 5,400RPM and 7,200RPM at the point of manufacture, which means there can be a substantial difference in drive to drive performance. 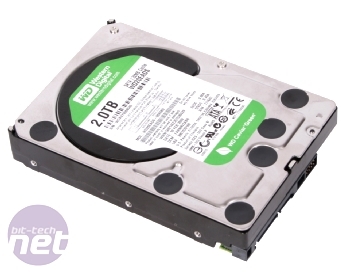 Justifying this erratic performance, Western Digital highlights the energy saving benefits of the drive thanks to numerous power saving tweaks involved in its IntelliPower technology, although the resulting saving in comparison to competing drives is a pretty minimal 4W – a negligible difference for the home users which this drive is targeted at. Even if you were to run the disk 24/7 all year long, your saving would average less than £5 and 20kg of CO2. The IntelliPower technology does allow the drive to operate incredibly quietly though and the listed idle and seek sound output figures of 25dBA and 29dBA really don’t do it justice, making it ideal for low noise environments like HTPCs. However, the luxury of cramming 2TB of storage into a single drive comes at a premium, with the drive currently retailing for over £250, or 13p/GB. In comparison even a high performance 1TB drive like the Samsung Spinpoint F1 sells for just 7.7p/GB, offering nearly twice the storage for your money. While we appreciate that new technologies and major advances like the jump to 2TB drives never represent the value sweet spot, here the gulf between Western Digital’s 2TB and competing 1TB drives is vast. Let’s hope that the 500GB platter density of the Caviar Green produces some impressive performance to help justify the price.